Security officer reporting software is not only better for your guard company clients, but it will make your operations run much smoother too. There are not many stakeholders left who will accept a pile of hand written reports with paper-clipped photos. Today’s clients want something that can be emailed to them; clean, professional and integrating any photos or videos that may be relevant. If they can have a geo-tag GPS photo, showing them the location of the scan, activity or incident, all the better. With GuardMetrics, your security guard services will have the capability to deliver such reports—all branded to your company and your specifications—easily and affordably. And we do mean easy deployment, easy to use, and affordable. 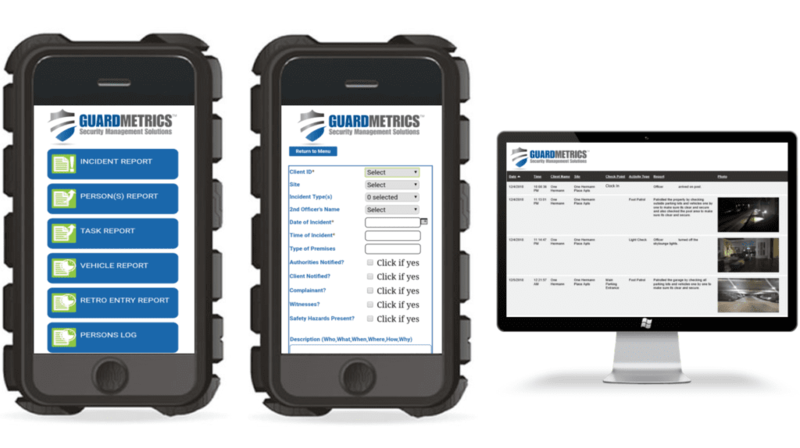 Call GuardMetrics now and easily deploy excellent, affordable mobile security officer reporting software. If your security guard service is still on the paper-reporting-system, or the “honor system” for guard monitoring, then the move to a modern method may seem daunting. Well, it’s not! The GuardMetrics security officer reporting software app was created by professionals from the security industry; not by software geeks that don’t understand the difference between the security industry and the maintenance or janitorial industries (no disrespect implied). GuardMetrics specializes in guards and in guard company needs, not in whatever industry might make us a few more dollars. Our support staff will have you trained to deploy this security officer reporting software in approximately an hour. You can be using your branded security officer management system within days of ordering, whether you and your guards have had experience with technology or not. Really! The interface is as simple as it looks in the pictures, and your officers can even login from their own mobile phones. And with the special way the security officer reporting app is designed, it won’t cost them, or you, in data or battery! Call us today to request a demonstration of the GuardMetrics security officer reporting software. When you call a GuardMetrics professional you’ll find out that we can help guard companies in a great many ways. This doesn’t mean that we’re going to try to “up-sell” you! Don’t worry! It simply means that we want to be your partner and help you grow in any way you can use us. The GuardMetrics security officer reporting system is part of the security guard management system, so to start, you will also have real-time guard tracking abilities and post order management, all for the same low price. Anything else you want or need, just ask. We’ve spent decades building a security industry network that can help in just about any way you imagine, as you can see under the “Services” button on the menu bar above. Contact GuardMetrics at (800) 825-6858 to provide a security officer reporting system app that will make your clients happy!